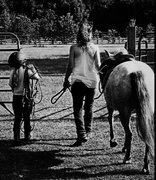 Specializing in lessons for young beginners using our well-trained Welsh ponies or lesson horses. We are also happy to work with students riding their own horse/pony subject to instructor's approval. English and Western riding instruction available in either a Private or Group Lesson program. We also offer our students Camps, Playdays and Shows. Ask about Boarding/Training/Lesson packages! 6 one hour private riding lessons for a single student at Jubilee Riding Academy - your horse/pony or ours. Special offer for new students! Registration fee waived. This is a $100 discount off the individual price of private lessons and regristration fee. To set up your lesson schedule please call our instructor - Lacey at 907-947-2564. Note - Lessons are not always available to suit every schedule. If you have scheduling concerns, please call BEFORE you purchase this non-refundable lesson package. Please download, print, fill-out, and return this form at or before your first lesson. Click here for form We must have a completed copy of this form on file for each student. 6 forty-five minute lessons for a student with a group of up to 4 riders at a time. This package must be used by a single student. You may only be purchase this packagre AFTER the student has successfully completed at least one private lesson package and our instructor feels the student is safely able to ride in a group setting. To set up your lesson schedule please call our instructor - Lacey at 907-947-2564. Note - Lessons are not always available to suit every schedule. If you have scheduling concerns, please call BEFORE you purchase this non-refundable lesson package. Item 5: One Lesson Mini! Mini lessons for mini persons with mini attention spans! 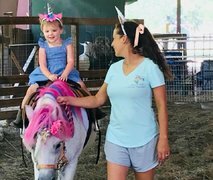 Children aged 3 to 6 are eligible for this 30 minute riding lesson program at Jubilee Riding Academy on our gentle riding ponies. Lessons may be private or may consist of one or two additional "minis". Parents/guardians must stay for the entire lesson and should be prepared to walk with your mini if your mini is riding in a group. No registration fee required. However we MUST have a Registration form and Release of Liability on file before any mini may ride. (Download here.) To set up your lesson schedule please call our instructor - Lacey at 907-947-2564. Note - Lessons are not always available to suit every schedule. If you have scheduling concerns, please call BEFORE you purchase this non-refundable lesson.